Documents reveal DUP lobbying over North Belfast housing and "allegations of gerrymandering"
The DUP has strongly objected to housing plans which fall “outside the North Belfast parliamentary constituency" as part of intense lobbying involving two of the party’s most senior figures, documents obtained by The Detail reveal. Internal memos, emails and minutes, written by officials from the Department of Social Development (DSD) and Northern Ireland Housing Executive (NIHE), catalogue 10 months of previously unpublicised meetings, which were facilitated by DSD Minister Nelson McCausland and attended by North Belfast MP Nigel Dodds and other DUP politicians from North Belfast. The wide-ranging documents show the DUP challenging officials over housing waiting list figures for Catholics and Protestants in North Belfast and closely scrutinising a series of proposals for the building of social housing across the peaceline constituency. 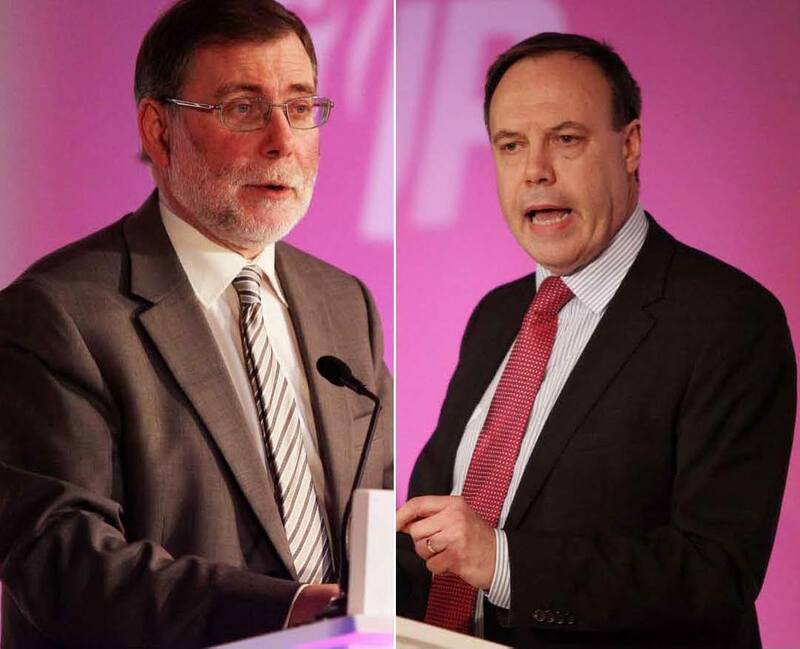 Mr McCausland and Mr Dodds do not contest that an allegation was made of gerrymandering, which refers to the manipulation of election boundaries. However they insist it is unclear who at the meeting, which included Mr McCausland’s special political adviser Stephen Brimstone, plus seven NIHE and DSD officials, made the remarks. The senior DUP politicians deny any wrongdoing and insist they were legitimately working on behalf of constituents. NIHE staff were requested by Mr Dodds to make an operational change to part of a peaceline interface, which senior Housing Executive officials regarded as a controversial ‘boundary change’. Housing Executive officials asked for but were not given access to minutes of DSD/NIHE meetings. NIHE officials were asked by the DSD Minister for the religious breakdown of North Belfast housing waiting list applicants. Mr McCausland told The Detail this was to test the validity of nationalist claims over waiting list figures. Nigel Dodds told NIHE officials its system for identifying housing waiting list figures was providing “perverse outcomes” and that its “system is broken”. Major confusion over official housing waiting list figures. While NIHE uses council boundaries to help determine housing waiting lists the DUP insists the figures are unreliable and instead parliamentary constituency boundaries should be used. The North Belfast constituency of Mr McCausland and Mr Dodds is viewed as one of the most politically sensitive areas of social housing in Northern Ireland, with nationalist and unionist politicians even unable to agree on official figures for those in housing need in the area. With the issue of social housing being so politically sensitive throughout the Troubles, the Housing Executive has striven to maintain its operational independence for the last 40 years. A management agreement between DSD and NIHE states that the Social Development Minister should only normally intervene in NIHE operational activities through discussion with the housing agency’s chairman, Donald Hoodless. However The Detail today publishes internal DSD/NIHE correspondence which reveals how the minister facilitated a series of meetings focusing on his own North Belfast constituency with DUP colleagues. The memos show the exhaustive extent to which housing issues in North Belfast was discussed and the anger of DUP politicians over proposals for new social housing developments that would relocate people outside the constituency’s political boundaries. The memo goes on to illustrate how further tensions and unease surfaced during the meeting over the official figures for the numbers of Catholic and Protestants on the housing waiting list, including an unattributed “allegation of gerrymandering”. The documents, obtained by The Detail through a Freedom of Information (FoI) request, reveal the discussions which Mr McCausland and senior DUP politicians held with NIHE officials over the North Belfast constituency took place over a 10 month period. The meetings appear to have exclusively involved only DUP politicians. The documents show that during one meeting on July 1, 2013 North Belfast MP Nigel Dodds asked NIHE officials to transfer control of Housing Executive homes in the Lower Oldpark district to the adjacent Shankill district. The reason for the proposed change was not explained but in a follow up email on July 25, 2013 a Housing Executive official wrote that both Mr McCausland and Mr Dodds had dismissed NIHE concerns cautioning them against the proposed ‘boundary’ change. It is unclear if other elected representatives in North Belfast were made aware that NIHE was actively considering Mr Dodds’ request to change control for the sharply divided peaceline district. In September 2013, an additional internal NIHE memo raised concerns that Housing Executive staff were not given access to minutes of previous meetings which they had attended with Mr McCausland and Mr Dodds. The documents show that a third meeting with NIHE officials on 16/09/13, held in Mr McCausland’s ministerial offices, was attended by DUP politicians, civil servants and an unnamed individual. A note of the 16/09/13 meeting reveals that an A3 map of the North Belfast constituency area was “laid out on a coffee table” to allow DUP politicians to ask questions of Housing Executive officials. The NIHE memo states that prior to leaving the meeting Mr Dodds referred to “perverse outcomes” and claimed that the “system is broken”. On April 1 The Detail asked DSD how many meetings Mr McCausland had held with NIHE officials on the North Belfast Constituency Area since 17/09/13 (following the three initial meetings which had been held during July and September). The statement said that eight other DUP politicians, including Mr Dodds, had attended some or all of the meetings. 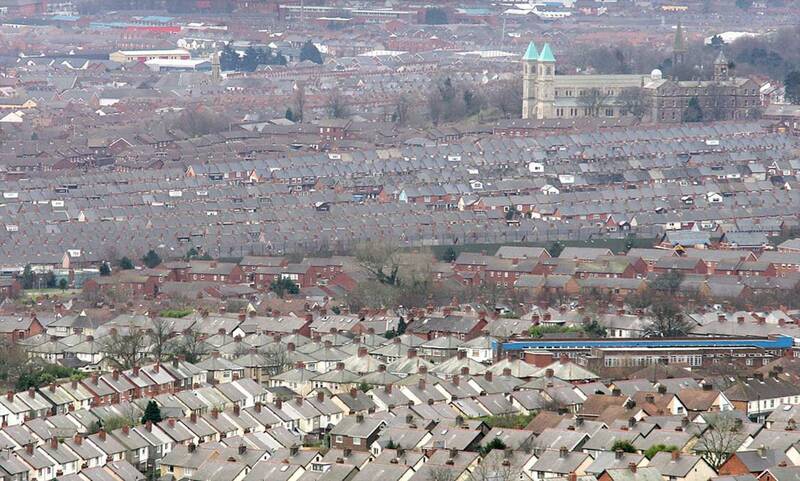 For decades the disparity over the number of Catholics and Protestants on the housing waiting list in North Belfast has caused major controversy. While the Housing Executive uses council district boundaries to establish levels of housing need, the DUP has instead argued in its political literature that wider constituency/parliamentary boundaries should be used. The party’s critics claim this draws in larger unionist/loyalist estates from neighbouring Newtownabbey. The difficulties in the public understanding of the different use and interpretation of figures is clear to be seen. However when the Detail asked NIHE for the official waiting list figures it stated that as of December 2013 there were 1,327 Catholic and 506 Protestant applicants on the waiting list by district for social housing in North Belfast. Mr McCausland has defended his close interest in housing issues in his own constituency as legitimate and necessary to represent the views of constituents. However critics have expressed concern that it could leave him open to accusations of a potential conflict of interest. In one instance Mr McCausland’s keen interest in housing issues in North Belfast led him to alert NIHE of a potential clash of interests after the Housing Executive had put forward proposals to build social housing on disused land at Fredrick Street close to the nationalist New Lodge estate. In a separate case, on September 10, 2013 an NIHE official wrote to a colleague to discuss potential plans to build social housing on disused land at Glengormley PSNI station. The email makes reference to the Queens Park and Glenvarna estates, which are both less than a mile away from the former police station, and are described in DUP literature as unionist estates. NIHE told the Detail that the development of the Glengormley site was still being discussed. 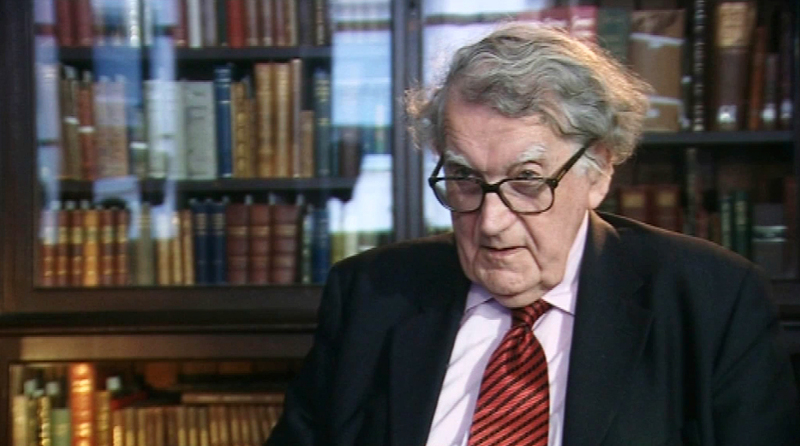 The Detail spoke to Dr Maurice Hayes, who was a senior civil servant at Stormont throughout the 1980s and is regarded as a leading expert in governance issues within the public sector. In 1987 Dr Hayes was appointed as the first Ombudsman for Northern Ireland, investigating government departments and public bodies for evidence of poor administration. The retired civil servant, who was not asked to comment on the allegations of gerrymandering but instead on the broader interaction between a government minister and officials from an independent public body, said that the DSD Minister’s intervention in the internal operations of NIHE gives cause for concern. “It’s an awkward situation and is something you would expect a minister to take great care over and to be aware of the boundaries, especially with an issue such as housing, which is so contested. “It creates even more of a problem that the discussions which were held seem to relate entirely to his (Mr McCausland’s) own constituency. The former NI Ombudsman said that while the Housing Executive is ultimately answerable to DSD and Mr McCausland as departmental minister, the accepted custom and practice makes it clear that NIHE should be independent to operate its day-to-day functions. “What the Housing Executive is required to do, like any other organisation, is to work within government policy. “The minister is entitled to tell them that, in line with broad departmental policy. The Detail submitted a series of questions to DSD relating to Mr McCausland’s ministerial role in NIHE housing issues in North Belfast. We asked whether the DSD Minister believed it was appropriate for Mr Dodds to have accused NIHE of “pushing people out of Belfast”? Mr McCausland was also asked to comment on the “allegations of gerrymandering” which had been made at the same meeting. In a written response, DSD stated: “The Minister is not in a position to comment on the reference to ‘gerrymandering’ referred to in the email document. It appears unclear who this was actually attributed to. We asked whether the minister had departed from the normal custom and practice, set out in a DSD/NIHE management agreement, which states that a DSD minister should primarily only engage in dialogue with NIHE through its board chairman. DSD said: “It is incorrect to say that this limits ministerial dialogue to the Housing Executive’s chairman. The Management Statement between both organisations states that, ‘communication between the Housing Executive Board and the minister shall normally be through the chairman’." We asked why only one political party had been invited to attend the ministerial meetings and whether other elected politicians in North Belfast had been made aware of the DUP request to move, what NIHE senior officials regarded as a “politically sensitive boundary”. Separately the DSD statement failed to explain whether other elected representatives in North Belfast were made aware of, what then NIHE chief executive John McPeake had cautioned was a “politically sensitive” request, to move the North Belfast housing boundary. The DSD statement defended the decision to instruct NIHE officials to attend the ministerial meetings. We inquired why, when NIHE officials were requested to prepare for a fourth meeting with the minister and DUP colleagues, the civil servants were denied access to minutes of previous meetings, which they had requested to help them prepare. We inquired why Mr McCausland had asked NIHE officials for a religious breakdown of applicants on the housing waiting list in North Belfast. DSD said that Mr McCausland had requested a breakdown on the religion of applicants following a report on inequality in social housing in North Belfast by the Participation and Practice of Rights (PPR) group. “This analysed North Belfast housing statistics by religious background in some detail and (the) minister deemed it prudent to seek clarification on the areas being referred to. Also, for some time previously there had been allegations that Catholics in housing need in North Belfast were being discriminated against and it was necessary to test the validity of that argument. We asked Mr McCausland if he believed that it was appropriate for him to have been so involved in housing issues in his own constituency, given that he is the minister whose department has ultimate responsibility for social housing. The DSD statement added: “The Minister has a duty to represent the views of his constituents, otherwise they would be disenfranchised. He also has responsibility for ensuring that social housing is provided for all citizens irrespective of religious or political persuasion and has publicly and consistently highlighted the need to build more homes and improve housing conditions for everyone in Northern Ireland. He also has a responsibility to respond to requests for meetings made by other elected representatives, in this case the MP for North Belfast. We asked NIHE if either the Housing Executive Board or its chairman Donald Hoodless had been aware of the meetings which Housing Executive staff had been instructed to attend with the DSD minister and other DUP politicians. “In terms of the meetings with local political representatives, this has not been discussed at board level as the meetings have been considered operational matters,” a spokesman said. We asked Nigel Dodds MP about his reported use of the phrase that NIHE were “pushing people out of Belfast”, and that one of those attending the meeting had made “allegations of gerrymandering”. The North Belfast MP said it was a matter for Mr McCausland and NIHE whether it had been appropriate for Housing Executive officials to have been present at the meetings with the DUP. Participation and Practice of Rights director Dessie Donnelly, whose group published a report on inequality in housing in North Belfast last year, said that the issue highlighted a “long line of political and statutory failings” in North Belfast. “The appropriateness of interventions of this nature in housing issues must be scrutinised – particularly given the sectarianised history of housing and the principle of no political interference in housing issues,” he said. “It must also be asked about whether a Minister is free to directly intervene in a fashion which raises questions over the obligation to target need and promote equality – which were cornerstones of the peace agreement. The Detail has redacted the names of individual NIHE and DSD officials. Jewellery, metal hips, gold teeth – why were families not told of cremation recycling scheme?